So let's continue with the story of my trip, though actually it's better if I go to sleep now, but since there are so many things to go through, I better get them all out before I forget them. Let's begin. So it was on Tuesday (May 3rd) that we were supposed to leave Paris and head to Avignon. We actually missed the train! By 6 minutes. I don't know whose fault it was and perhaps there's no point of assessing whose fault it was but I couldn't help to take it as my fault. If only I had made it so that we left the hotel earlier and if only I had been more alert perhaps we wouldn't have been lost on our way to the metro station (which we had used a few times) and didn't lose so much time. I was pretty devastated because I don't like mistakes and failures. I put a lot of F in my facebook's status that day and Carl said that I wasn't meant to take that train and I should take it easy. Still, an 85 euro mistake is (still is) very hard to swallow :( The new tickets cost more than double than the previous ones and I still feel kinda upset about it because I planned this and yet it got screwed up. If God wants me to learn about letting go and accepting failure in this trip, I know I still fail pretty badly in that. I just can't take things not going as I want them to be, but that is the very essence of life, no? Okay, enough ranting about things that I shouldn't keep in my heart anymore. We made it to Avignon although a bit rather wrongly. We supposed to arrive at the Avignon Centre train station but the replacement tickets that Mau got, got us to Avignon TGV train station. Luckily there's a shuttle bus and for some reason, it was free. I have to say that in Avignon TGV train station, we saw a bird who's flapping its wings frantically and yet it didn't move at all, it just kinda hovered in the sky. We don't know why and we are kicking ourselves for not taking any picture or video of that bird. Other people were looking at the bird as well but I didn't see anyone taking any picture or video either. Anyways, back to Avignon. Avignon is a town on the south of France. Our hotel was near the station. I'm gonna tell you how directionally challenged I am. To go to the main sights of Avignon, one just needs to follow the straight road that runs from the train station to the centre of the town's historical landmarks. A straight road and I managed to take a turn somewhere that I was a bit lost when I wanted to go to Palais des Papes!!! Stupid me! Palais des Papes was the first thing I saw in Avignon. I didn't it like much. It gave me the creep. I think because it's old and rather dark and I just can't see how the popes could love staying there. Maybe it was rather nice back in its heyday. So I didn't spend much time there. 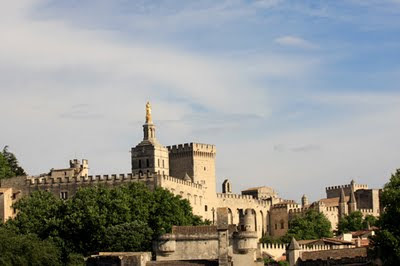 Here you can see the picture of Palais des Papes and the one with the gold Virgin Mary is Notre Dame des Doms. After leaving the palace, I wondered around and next door there's the entrance to the garden Rocher des Doms. I love this place. It was not completely void of people but there's not really many people there and I just had a nice time, strolling alone, looking at everything and taking every view. I was feeling rather at peace and I guess I calmed down because now that I think of it, I didn't think about the fact that I missed the train when I was there, I was just thankful to God for being able to be there. There's a cave like structure with a fountain inside it. The only way I can explain it is it's like an open cave. Anyway you can go to the top of it and it's pretty fun navigating yourself among the rocks. I spent quite some time looking at the people there and looking around, there's a small vineyard nearby. Definitely my favourite place in Avignon. I didn't actually visit many places there. I did cross one thing that I wanted to do in France, which was to go to Carrefour :P Anyway, digressing. After which, I went to see Pont d'Avignon / Pont St-Bénézet. The ticket covered both Palais des Papes and Pont d'Avignon. Pont d'Avignon is a bridge which is now only half of what it used to. Flood caused a lot of damages to the bridge and so some parts of it collapsed. Now it's like a bridge which is a bit stuck in the middle of the Rhône River. I didn't listen to the whole audio guide. Basically there's a story about a shepherd (Saint Bénézet) who got a vision from God to build a bridge. The local government said there's no way and no point of building a bridge. Then he kinda managed to lift / put a heavy stone as the foundation of the bridge and people then became believers of him and started building the bridge. So that's Avignon. As I said, I didn't explore much. There were a lot of shops selling lavender products (Provence is famous for its Lavender) but I didn't get any. I thought I'd come back to the shops, but I didn't have the time to. To see more pictures from Avignon, you can go here. The next day we had Provence tour. The day started with visiting Orange. We saw its Triumphal Arch and the ancient Roman Theatre. 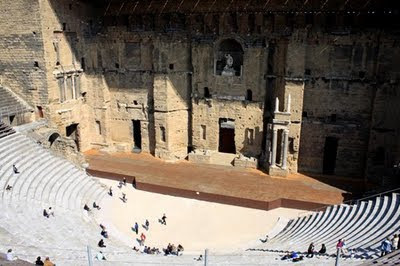 Granted the Roman Theatre is not as what it used to be but it is still a working theatre. If I recall correctly, I think a production of The Phantom of the Opera is gonna be staged there soon. I think it's so much fun and definitely memorable to perform at such an old stage in which it has been used for hundreds of years. After Orange, we had wine tasting at a vineyard, Ogier, which is at the Châteauneuf-du-Pape area. I don't drink a lot and often but I kinda like visiting vineyards :) and now I kinda like the smell of wine as well :) Anyway at Ogier, the grapes are grown on 4 different types of soil, there's the soil that are covered with rocks like pebbles and other are covered with other types of rocks. The same grapes grown under these different soils do produce different taste of wine, it's interesting. After the wine tasting, we headed on to the village of Roussillon. This place is so beautiful for me and its images really lasted in my head. 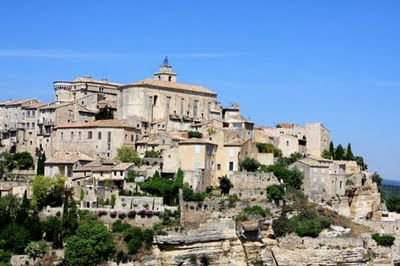 When I was in Provence, I didn't think that Provence was so amazing actually. I kept on comparing it with Tuscany and I was thinking of how I love Tuscany more. 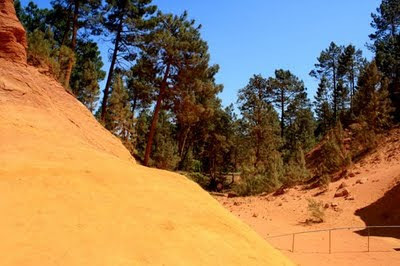 However Roussillon with its colors were just amazing for me. The ochre landscape is striking being set against the blue sky. I love it so much! There's a hiking track that one can follow to explore the area. Unfortunately we didn't have much time to spend in this village that I only explored a little bit of it. I felt kinda sad about it. Even though I only went in for a short walk, I love it so much. The colors were amazing for me. Even though the part which I walked in was small and the landscape were totally different, but because of the colors I kinda had a James Franco's 127 hours moment there :P I really really think this place is awesome. I guess because I've never seen anything like it before. The last stop was to see Pont du Gard. 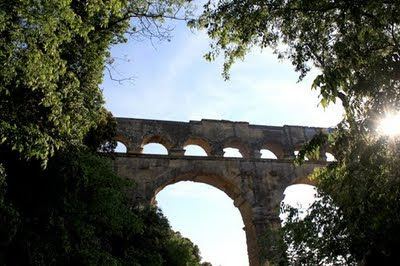 Pont du Gard is an aqueduct, which means a bridge which was used to transport water as well. It was big and the sun was still in the sky but it hit the wall at such an angle that my head was telling me how I love the way the sun kissed it. I love it because it just looked so majestic and as usual I'm a sucker for historical and old stuff and to see something like that, I was just in awe, in full of gratitude to God that He gave me the chance to see such things. My travel always made me feel thankful to God for being alive and for being able to be in the places I've been and see the things I've seen. Is it wrong for me to say that I need to travel more, simply because travelling brings me the moments I am most thankful for my life? Anyway, to see more pictures from the tour, you can go here. The weather was great but the wind was crazy. Adeline, the nice and sweet guide, explained to us that the wind is known as Le Mistral. I remembered Mr. Ben explained this on his first class with us. It's a really really strong wind. There were times when I felt that I was being pushed. But this wind drives away the cloud and as a result you get a really really blue sky. Yeah, it also causes them not to have much rain, I think they have less than 30 days of rain a year but since they have rivers all around, I think they're doing okay and Provence is not actually a hot place. I remembered when we were driving, I loved how the strong wind caused the grasses to move like waves, it looked pretty nice. Still, I can't really say I'm a big fan of the wind :P I'm gonna stop now. I think one more post about France and we're done with France *hopefully* Darn, it's really late now, I really have to go to sleep. I really don't know how to face Mr. C tomorrow :( Buonanotte tutti!